Sarah (foodie, baker, busy mom) from Winter Park, CO sent me this and raved about it. Perfect for a birthday celebration. Her husband Chris (foodie, home chef, wine connoisseur) said it was the best crème brulee he ever had! Happy Birthday Chris! In a bowl, whisk together egg yolks, vanilla, salt and Truvia. Gradually whisk in cream. Strain. Divide into 4 ramekins. Custards should be set, but still jiggly. Chill for one hour. While chilling, prepare the butter-pecan topping. Heat just until pecans begin to color, being very careful not to burn! Divide between ramekins. Refrigerate for four hours or overnight. Tips: Place ramekins in large roasting pan and set pan on pulled out oven rack. Then add water to reach ½ way up side of ramekins. Sarah baked for 30 minutes and they were perfect. I was just reminded of a wonderful salad addition this morning from my friend Jean (foodie, brilliant home cook, exercise partner). 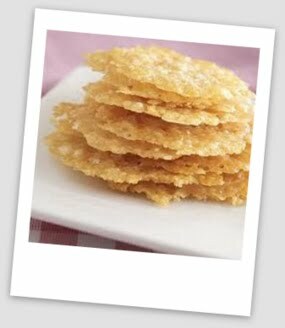 These are so great in a salad and I do crave crunchy things. Kind of salty which is perfect! Thanks Jean, see you in Italy(more on that in coming posts). Pour heaping tablespoon of cheese onto prepared baking sheet about 2 inches apart. Tips: Spice it up with cayenne pepper, sesame seeds or black pepper. Using a Silpat makes this so easy. Just when you remove from the oven make a little basket out of the cheese by placing over inverted small bowl. 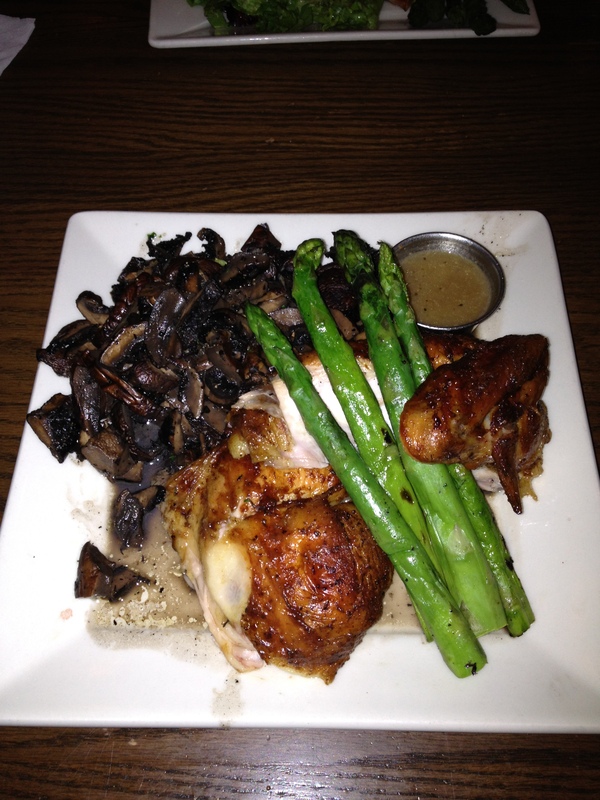 I am getting the hang of finding great low carb options while dining out. While traveling this week I happened upon a place with a great menu. The Met Bar in Boston has a “build your own burger” section of the menu with a bun-less option. I choose the “burger in a bowl” on arugula with balsamic vinaigrette. It was served with cheddar cheese, sautéed mushrooms and a slice of tomato. There were multiple mouth-watering options of cheeses, toppings and greens. 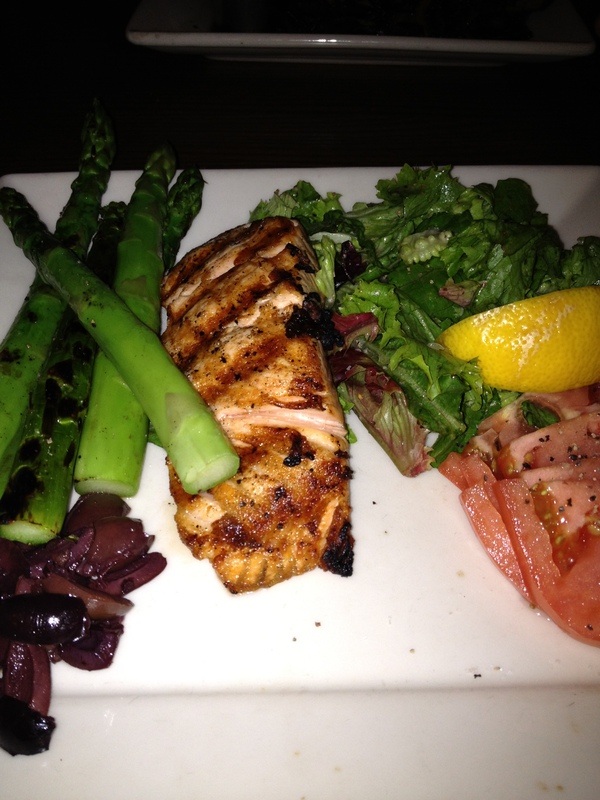 My meal was so delicious, bun-less is the way to go. I definitely want to try this at home. It would be great with turkey or salmon burgers to. 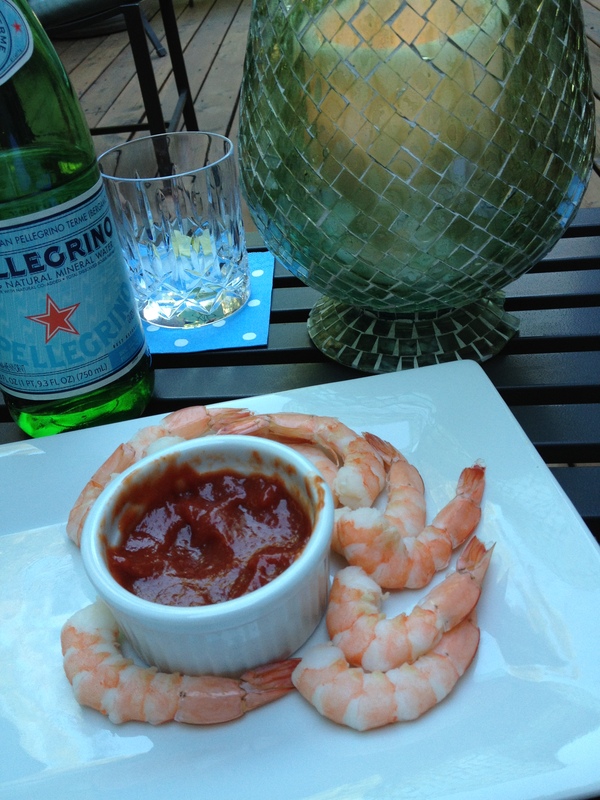 So many options..
Good news~ 4 large shrimp have zero carbs. It is the cocktail sauce you need to watch out for. Approximately 1 carb per Tablespoon. 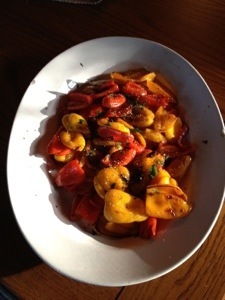 This summer I have found bags of tiny assorted peppers and they are perfect for Grilled Peppers. Wash peppers and prepare as usual and only need to cut in half. Toss with olive oil, salt and pepper. Grill over med-high heat in grill basket for 10 minutes or so until dark char forms around the edges. Serve with fresh chopped herbs such as basil, parsley or cilantro, depending upon what else is for dinner. Tip~ leftover peppers are great in omlettes! 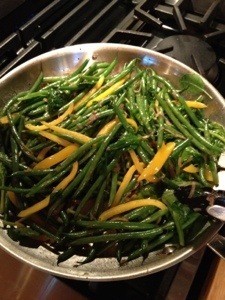 This Haricot Vert recipe is an adaptation from Fine Cooking magazine last summer. I leave out the orange juice as it only seemed to add carbs and not that much flavor. Steam the washed beans in steamer basket for 2-3 minutes. In large skillet, heat oil and saute rosemary and shallots for 1 minute. Over medium heat add beans and peppers and stir for a couple minutes until peppers soften. Add vinegar, stir then add spinach and cook only until wilted. Less than 1 minute. This was a great low carb dessert for our birthday celebration. I found almond flour in bulk quantities at the local food coop. Great price compared to the small packages in grocery stores. Whisk yolks until light in color, add all ingredients except egg whites, whisking lightly with each addition. In mixer, beat egg whites until soft peaks form. Gradually add egg whites to almond meal mixture, folding in gently. 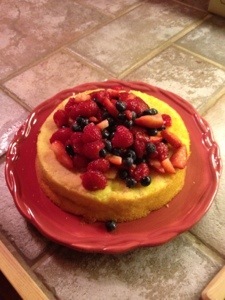 This has 5 net carbs per slice (12 slices/cake) Fresh berries on top extra!